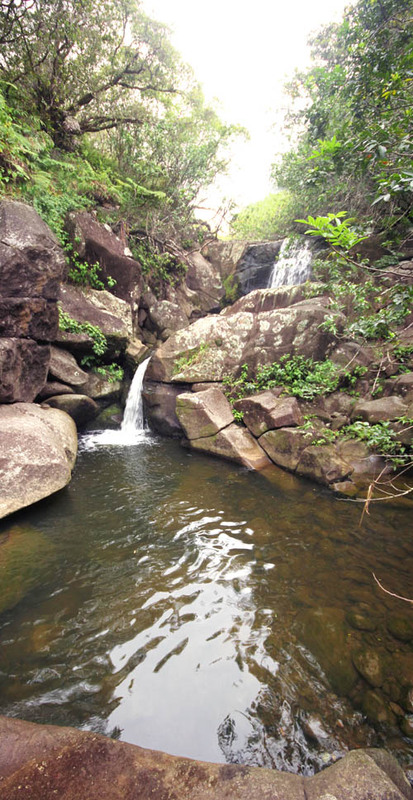 On the fourth day, we cleared the trail that leads to the pools and waterfalls at Queen’s Bath in the Kamakou mountains above East Molokai. 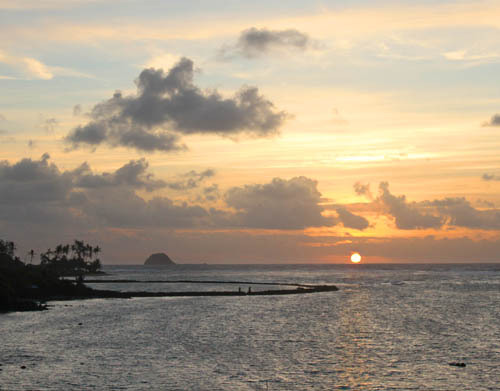 We awoke before dawn again to see the sun rise over Kahinapohaku Findpond and Hoʻoniki Island. 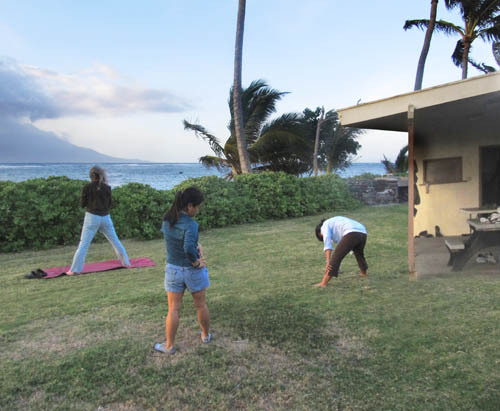 This time, we were just amazed that vog-like atmospheric conditions persisted on the horizon that filtered the intense rays of the sun and allowed us to stare directly into the sun with naked eyes. 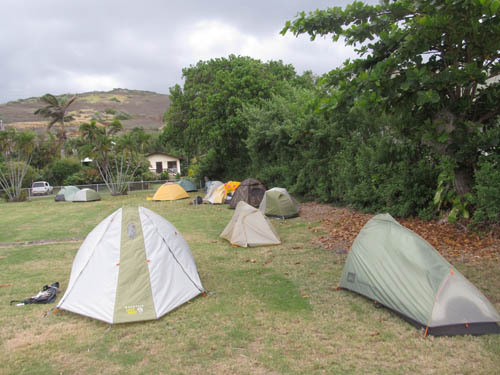 The plan for the morning was to pick-up the rest of our group from the Hawaiian Trail and Mountain Club (HTMC) that was flying-in from Honolulu. Since only the drivers needed to go, the rest of the gang relaxed and played at the pavilion. August napped whiled Kay, Jeanne, and Karen did yoga, and Wayne and Ellyn went swimming in the ocean. Wayne — an avid spear fishing enthusiast — dived in the channel beyond the reef just offshore. Thea and I drove into Kaunakakai, exchanged our SUVs for larger vans at Island Kine Car Rental, and picked up the rest of the trail-clearing crew at the airport. We then stopped by the Friendly Market to pick up groceries and other supplies for the remainder of our trip, and drove back to our camp site. 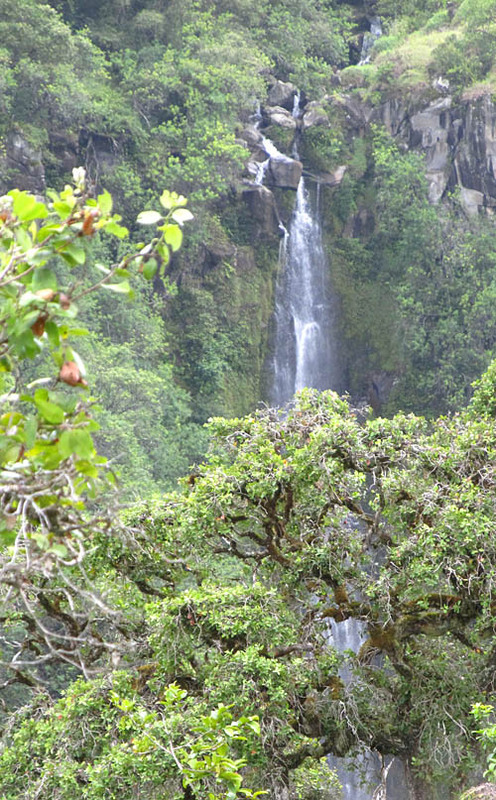 Once the group settled in, we drove to the trail head and pushed-off for Queen’s Bath. 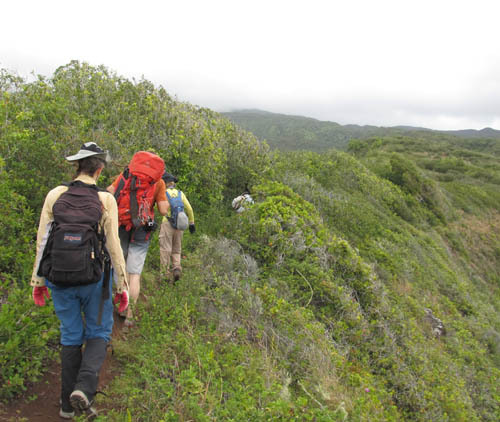 Starting from sea level, we made our way up a ridge over dry dusty terrain overlooking the East Molokai coastline. 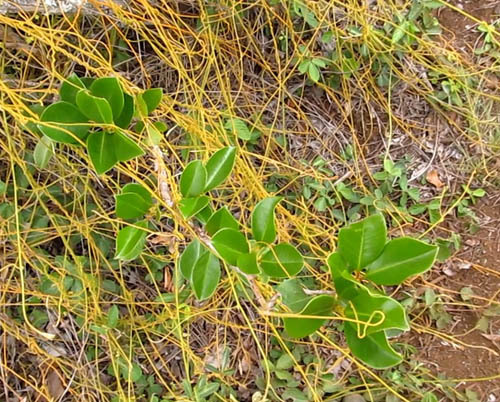 We saw patches of non-native kaunaʻoa, a species of doder (Cuscuta sp) which grows as stringy orange vines on other plants. The vines are parasitic and draw their nutrients from the host plants upon which they climb. 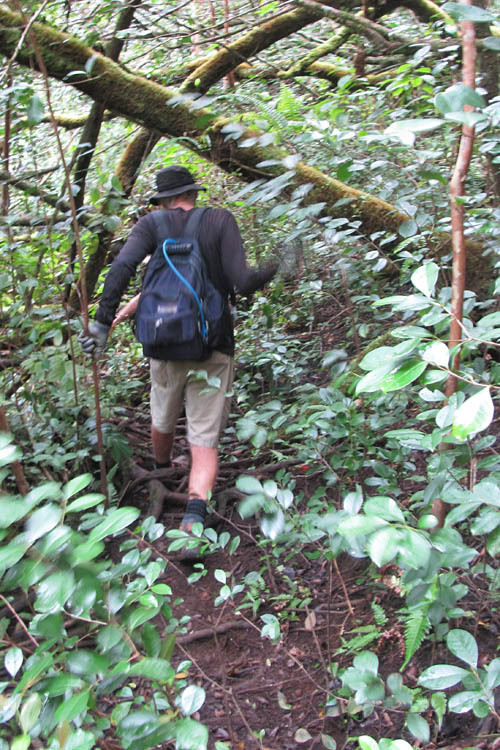 After gaining nearly a thousand feet of elevation, the vegetation became increasingly native. 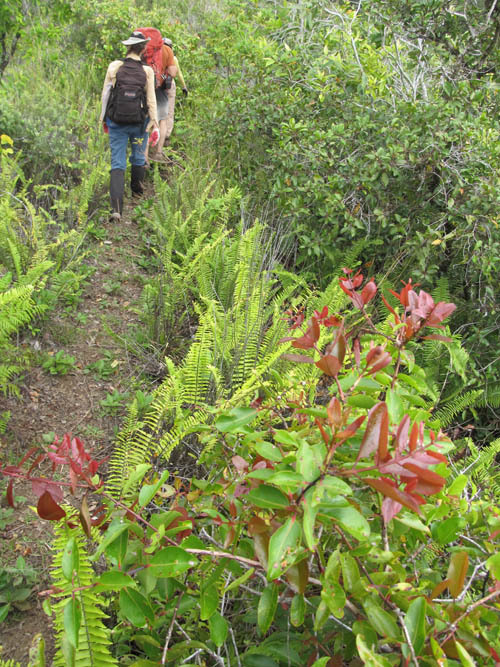 Kupukupu ferns (Nephrolepis exaltata) — which prefer drier climates — thrived along the margins of the trail under ʻōhiʻa lehua (Metrosideros polymorpha) shrubs with red liko (young leaves). 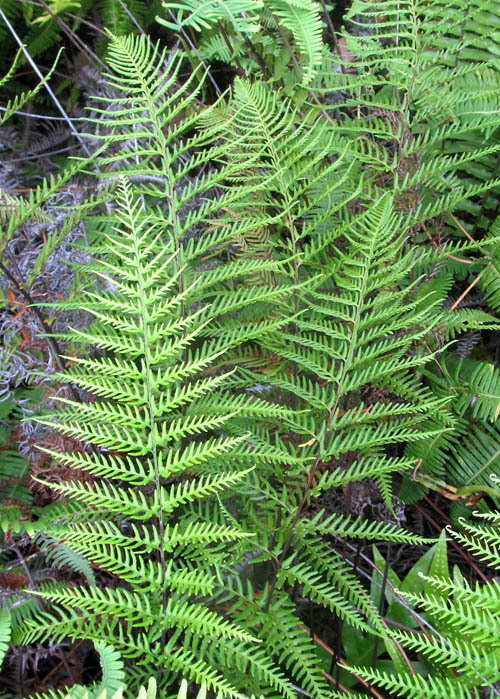 We also saw many gold ferns whose light airy fronds thrive along side the trail. 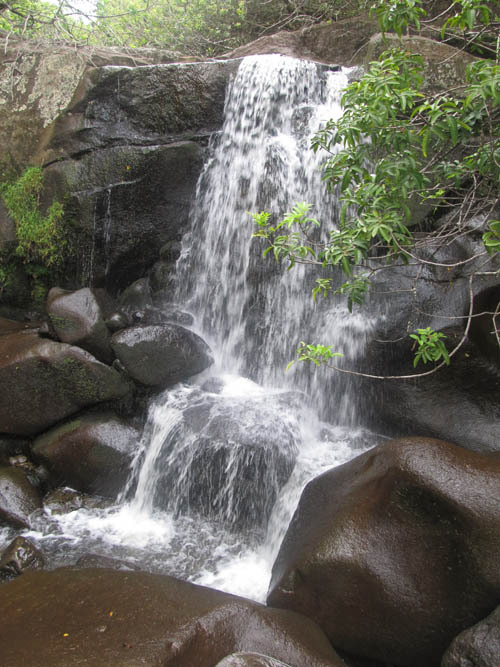 While making our way up the ridge, the goal of our hike — the top of the waterfall — came into view. 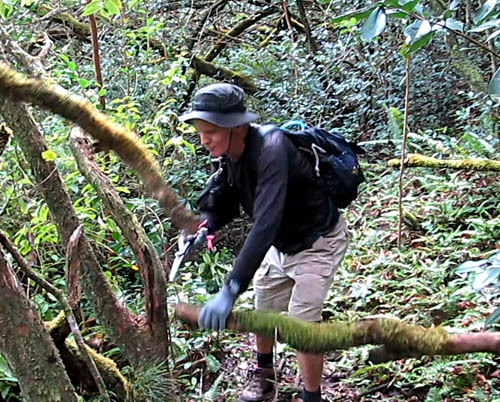 We veered-off the ridge line and contoured into a hanging valley where we hacked at the ferns and cut the strawberry guava to re-open the trail. The strawberry guava soon gave way to christmas berry or brazillain pepper (Schinus terebinthifolius). Although we could see the trail for most of the way we had to duck under and hurdle over christmas berry branches that blocked the way. Christmas berry is especially bad for trails because its branches grow upright first and then drop down over the course of time to block the trail. If left unchecked, christmas berry will create an impenetrable tangle of branches. 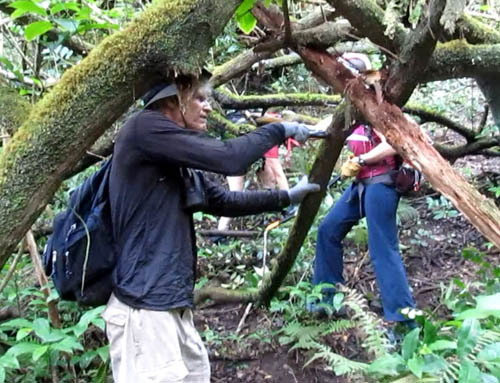 Much of the day’s work entailed sawing christmas berry branches that blocked the trail. John’s technique involved sawing the under side of the branch first before sawing from the top. This enables the saw blade to escape from being pinched by the partially-cut branch as the force of gravity pinches gap between the cut ends of the branch. 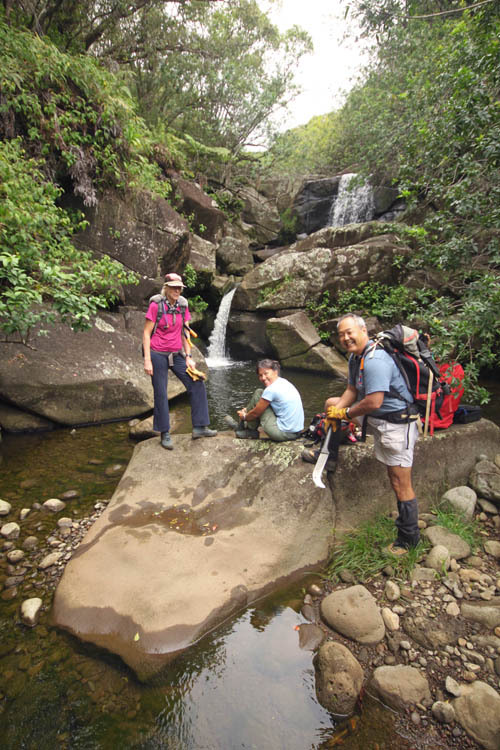 After losing the way forward several times — there were multiple trails — some of them pig trails that led under impenetrable christmas berry tangles — we refound the proper way forward and got to a vantage point where we could see how close we were to the top of the waterfall. But we still had a ways to go with branches of strawberry guava and christmas berry blocking the way. With so many alternate paths, the way forward often became ambiguous. So we often had to backtrack and refind the right way forward. 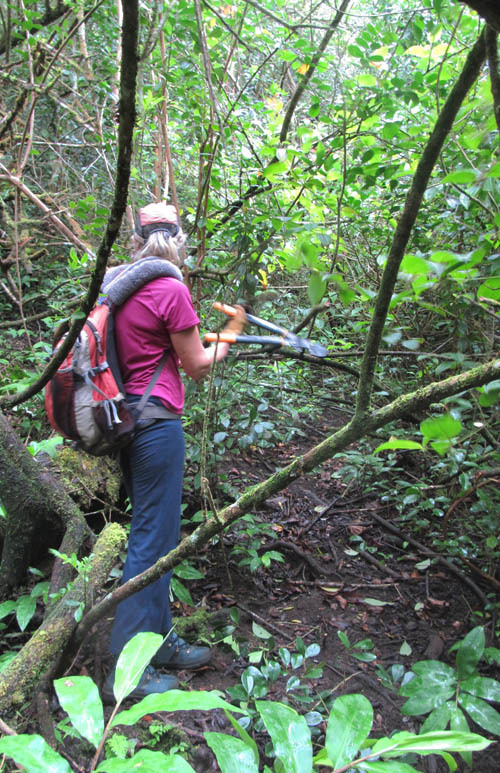 We also encountered clidemia half an inch thick which were difficult to cut with machetes — the blade just bounced off the thick woody stems. 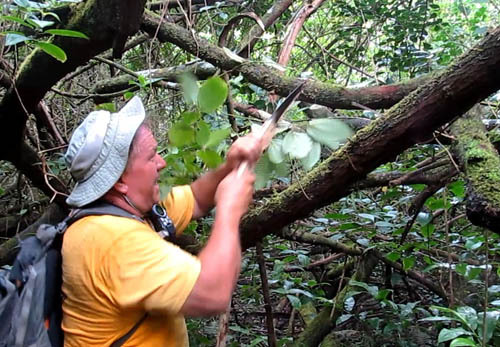 Fortunately, Grant made quick work of the clidemia with his handsaw. 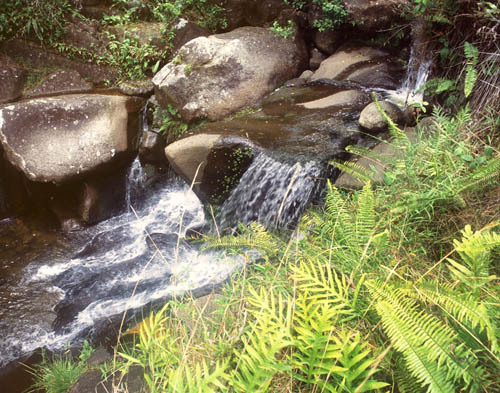 After sawing through more christmas berry, the sound of flowing water told us we were near. We passed an area with rock walls that looked like terraces which suggested to me that Hawaiians once cultivated kalo and other crops at this spot. We were thrilled when we finally broke through and reached the stream! Unlike the streams we had visited yesterday whose waters were stained the color of tea (derived from standing surface water), the water at Queen’s bath was crystal clear. Queen’s Bath is awesome place to visit. We could not resist jumping in the pool to feel the waterfall falling on us. The pool is chest deep and cold! The water was crystal clear and cold, which suggested to me that ground water was the source. It was refreshing to stand under the waterfall to feel the force of the falling cold water. Kris, Ellyn, and Grant pose at the pools and waterfalls at Queen’s Bath. Since it took us so long to refind and clear the trail we had a late lunch at 3 pm. We spent quite some time at the pools, eating lunch, jumping in the water, and exploring the area. Time passed quickly at Queen’s Bath and soon it was time to leave. 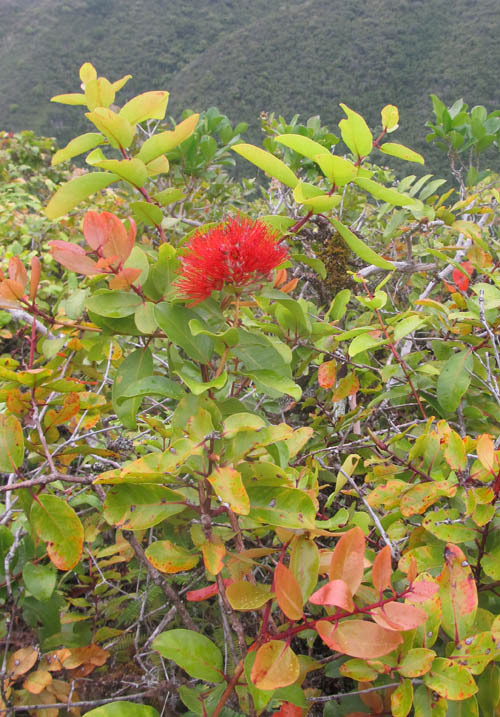 As we descended the ridge to make our way back out, we saw a number of ʻōhiʻa shrubs with attractive red lehua flowers and pink liko (young leaves). 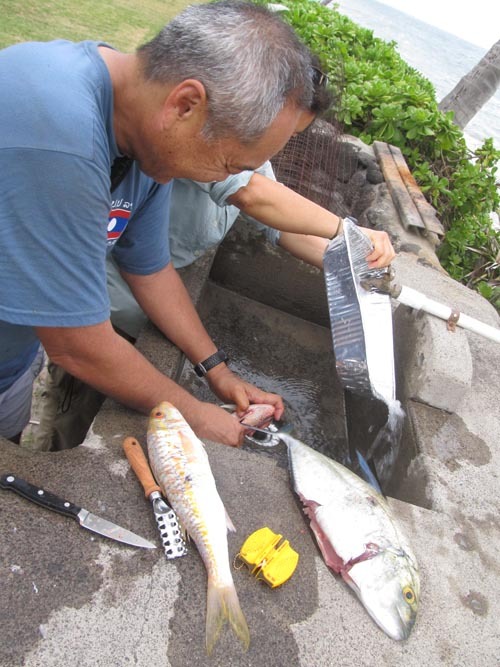 When we returned to the Waialua Pavilion where our tents were set up, we learned that Wayne, who had been diving, speared several good-sized fishes — papio and weke! Master fish cleaner and cook Grant volunteered to clean and prepare the fish for dinner. 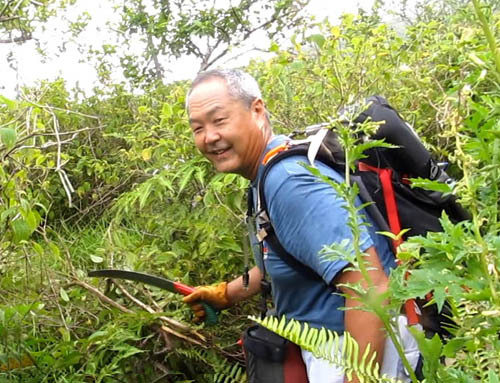 We were also fortunate that Cyrus Siu — who asked us to come to Molokai to reopen the Wailau Trail that we would clear the next day — made a most delicious stew from a deer he shot. We wasted little time chowing down the hearty meal of deer stew and fish. 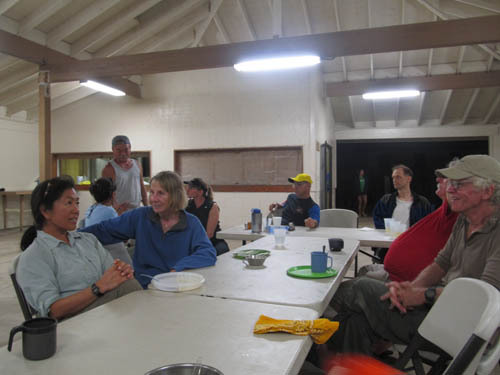 After eating dinner and enjoying each other’s company in the pavilion, we prepared for the next day’s adventure and retired to our tents for the night. 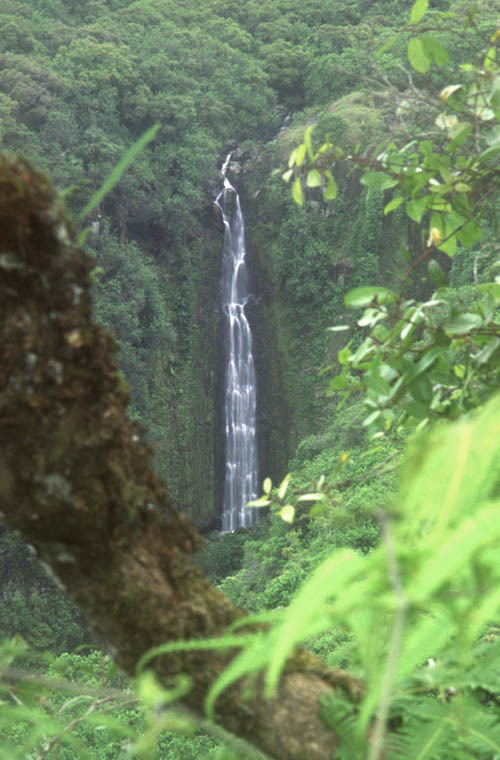 While settling in my tent to sleep, I could not help but replay in my mind the great time we had seeing awesome waterfalls in East Molokai, reopening the trail to Queen’s Bath, and jumping in the refreshing pools. What a awesome trail to clear! Awesome Trek, Nate!!! Great Write up….Hope to see this place first hand!!!! Aloha Nate, Your write up about this place is amazing! If it is ok, would you be willing to give me directions to this wonderful hidden place. My friend Ryan Chang and I will be on Molokai from March 24 to March 30 with our YMCA, doing several service projects across the island. We have pockets of free time, and might be able to access it. Mahalo again for such a great blog entry. Finally saw this place up close, Nate!!! It had very cold water but it was really refreshing!!! I hope to visit here again…Thanks again for your advice on finding this place.